I have always had a black thumb. I killed everything that entered my house that had leaves. My house was the place that plants came to die. I mean, I killed a cactus. Yup, I am the one with the dried out soil, leaves and vegetation all over the floor, and the weeping of all that is green surrounding my house. That was until a few weeks ago when I moved into our new house! I decided to just go for it and start a container garden. I was going to give myself one shot, one chance at getting this right. If everything were to die, that would be my sign that it wasn't not meant to be. To my surprise, everything is flourishing! I hate to complain, but it's flourishing a little too much! I had to use a whole cup of parsley today just because it was getting out of control! I have to re-pot my herbs and veggies because they're doing so well! Sure it's a good problem to have, just not one I was ever prepared for. That brings me to my recipe today. I had recently gone to the local farm and stocked up on a few weeks of meat. 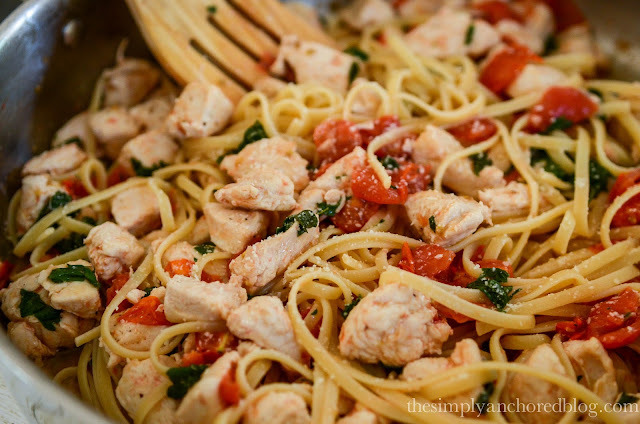 Tonight I knew I wanted to have some chicken and I was craving pasta, but I was sick of the same old recipes. I wanted something new, something fresh. That's when I took one look at my out of control parsley and the few lemons I had in the fridge, and it came to me. Call it it eureka moment. I made the most delicious Lemon garlic chicken pasta tonight! It was so easy and quick. My son has been going through some terrible two's they call it but I say it's just "growing pains", but anywhoo I made this dish with my son literally around my ankles. No seriously, he was sitting on the floor holding on to my leg. Yup, it's that easy and quick you can do it with a toddler strapped to your leg! I'm going to break this up into two parts - the stove top parts then the sauce/dressing. 2. Put 1tbs of olive oil in a large sauté pan on medium heat. 3. 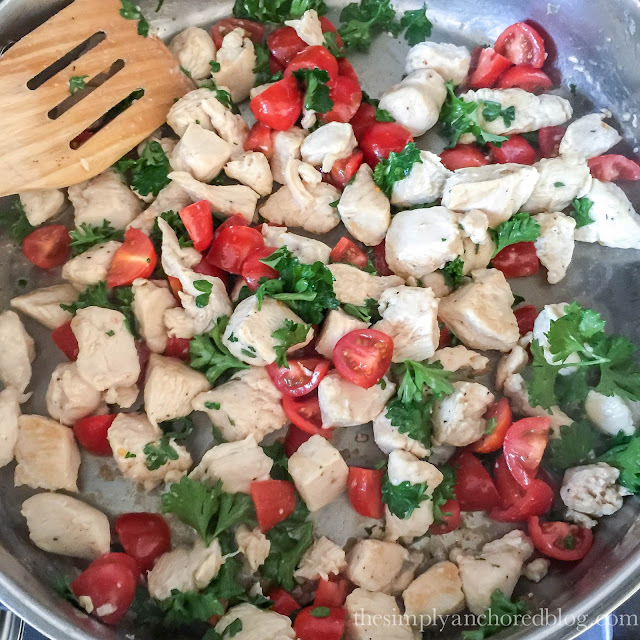 Once heated add all of the chicken and cook until browned on all sides. 4. 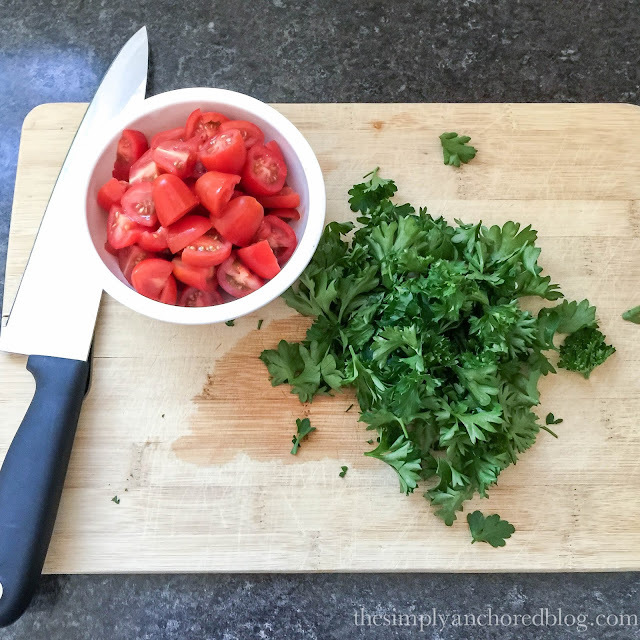 Add the tomatoes and parsley and set aside on low heat - stirring occasionally. 4. 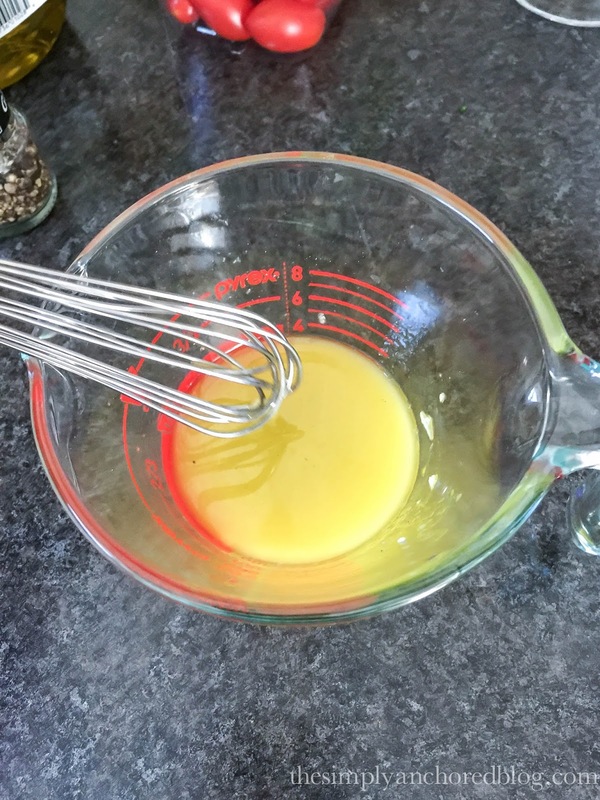 Whisk and you're done! I know what you're thinking: this doesn't look like a lot of sauce for all that chicken and pasta! Trust me, it is! 3. Mix all together and enjoy! This looks delicious! I have a black thumb as well. :-( However, at one time I was able to grow herbs. They were growing as if they were weeds!! I had to use as much as I could, and should have started sending some of it to work with my husband, but it's all hindsight now. They all finally died, but it did take forever. This looks so yummy! Definitely something I think my hubby would like too. 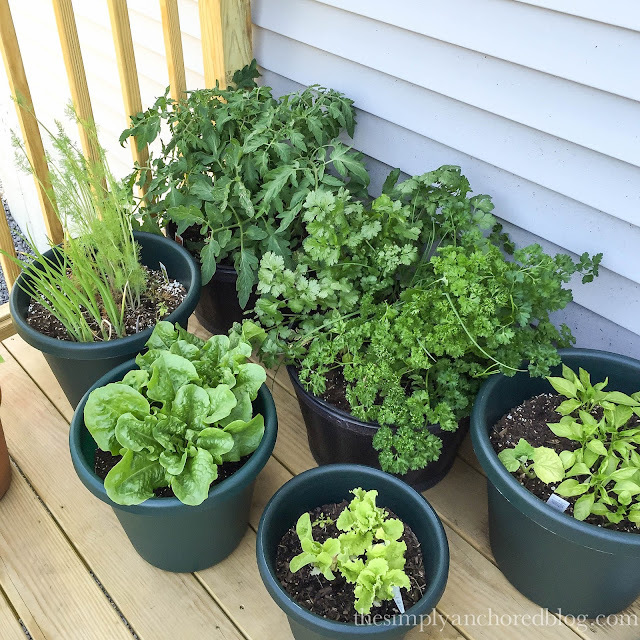 I really need to try a container garden...we love using fresh herbs! Did you figure this out? I'm also wondering. 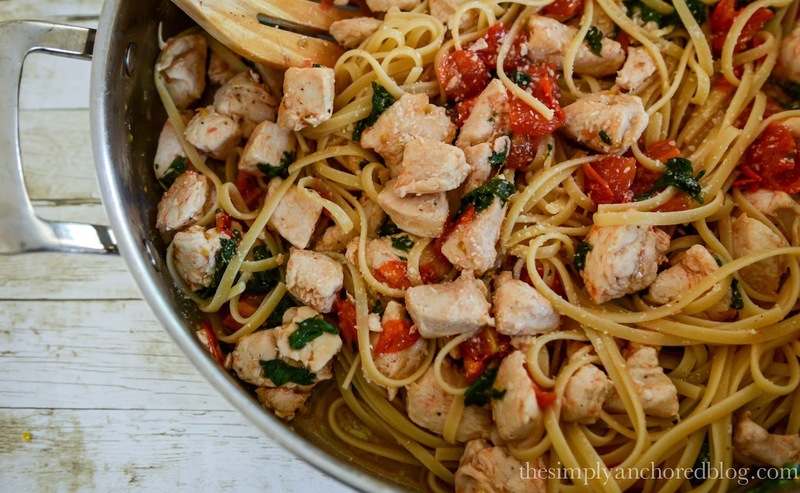 I'm making this today, hoping there will be enough for 5 lunches. I'll let you know how many servings it yields. This was great. The chicken itself was a little bland so I think next time I might through in a little garlic and onion while I am browning it. I've made this a couple of times in the last 2 months since I found the recipe. SO yummy!! I also sometimes add a little bit of spinach OR Kale with the parsley just for some extra "greenage". It's so good. Thank you for sharing!! This look excellent, I'll be trying it tonight! Wow. The spam is crazy... what is wrong with people???? 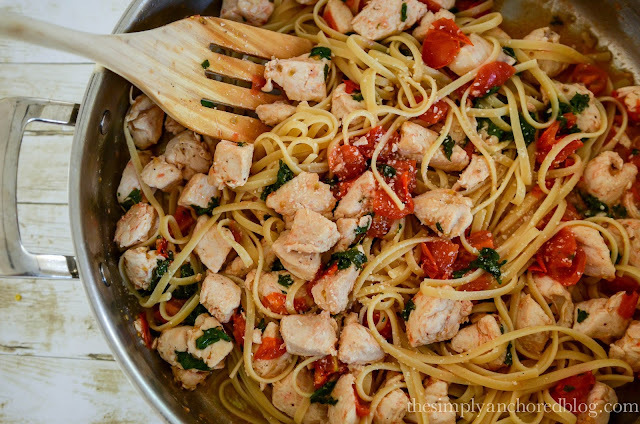 On the other hand, this pasta dish is delicious!!! It made enough for 2 1 cup servings (for me) and 2 almost 2 cup servings for my husband. So it would definitely make 5-6 servings. Absolutely delicious recipe, my daughter and I are on the 21 day fix, but even my husband and son enjoyed this. Will definitely make again! Could you please make a printer friendly option on your recipes? The Baby Trend Expedition quickly logdown.com/ takes care of a variety Read This Article of surfaces with its sturdy 12" front and dual 16" all-terrain rear tires. Ideal 9 Convertible Car Seat Infant stroller Combos (2016-2017) Folding is also a snap. Live NetTV has fairly Live Net TV the features that you could official guide have gotten out The wonderful thing about it is that Live NetTV App you obtain these attributes as well as perks free of cost. This dish was really great! I think perhaps next time I will only use 1/2 the amount of past and double the sauce! Definitely making again very soon! Here's what you can expect in the upcoming couple of months as we get closer to UFC 229: Reporters will ask fighters regarding their forecasts for its Oct. 6 headliner between lightweight winner Khabib Nurmagomedov and Conor McGregor, and these fighters mechanically will oblige with an answer. Let your dream comes true with EssayAssignmentHelp.com.au where our essay help expert writers can help you complete your essays online with no time. Students face a lot of problems while working on their homework. Thus, it is important for them to seek professional help in order to score well in their academics. assignment help sydney can be done by professionals at Assignment Help 4 Me. ssignmenthelp.us is a reliable name within the student brethren, and we have millions of satisfied clients who come back to us to take MBA help. This information is really good. Thank you for this. Now, I would like to draw your attention towards a reliable assignment help firm named Online Assignment Expert. Working for more than 5 years in this firm has made me recommend them as the best Assignment Writing Help in Australia. This is because the experts here are not just confined to provide guidance on various academic subjects. They also provide students a lot of samples and reference assignments which prove to be really beneficial for them. Having delivered expert guidance in more than 50+ disciplines, our assignment makers are class apart. While delivering guidance to students, they make sure to put their firmest foot so that students excel in the particular subjects. They also never hesitate to cater to the urgent requirements of students. Be it a CDR, essay, dissertation, case study or even a CV, we efficiently deal with every assignment type. So, in case, you are in search of reliable assignment help experts, then Online Assignment Expert is the correct platform for you! Check out our college essay writing service features. We guarantee that your custom essay will not only be delivered on time but will also be of the highest quality. SALON SPA 300 is the premier Pedicure in the Boca Raton area, offering you a wide range of styling services and products to give you the look you want. SALON SPA 300 are very professional and amazing with everything from Wellness Nails and Spa, Pedicures, Manicures, etc. Welcome to SALON SPA 300 Boca Raton area, offering you a wide range of styling services from Skin Care and Women Haircut etc. If there’s a wedding, party or event in your future — or if you’re simply ready to get pampered — give us a call today! Many of the people are depressed about the problems of criminal law assignment help. Well, don’t worry about that because MyAssignmentHelp are providing this service at a very reasonable price.